This article describes how to microinject viral vectors into mouse brain and then test in a conditioned place preference paradigm that includes an acquisition, extinction and reinstatement phase. Schierberl, K. C., Rajadhyaksha, A. M. Stereotaxic Microinjection of Viral Vectors Expressing Cre Recombinase to Study the Role of Target Genes in Cocaine Conditioned Place Preference. J. Vis. Exp. (77), e50600, doi:10.3791/50600 (2013). Microinjecting recombinant adenoassociated viral (rAAV) vectors expressing Cre recombinase into distinct mouse brain regions to selectively knockout genes of interest allows for enhanced temporally- and regionally-specific control of gene deletion, compared to existing methods. While conditional deletion can also be achieved by mating mice that express Cre recombinase under the control of specific gene promoters with mice carrying a floxed gene, stereotaxic microinjection allows for targeting of discrete brain areas at experimenter-determined time points of interest. In the context of cocaine conditioned place preference, and other cocaine behavioral paradigms such as self-administration or psychomotor sensitization that can involve withdrawal, extinction and/or reinstatement phases, this technique is particularly useful in exploring the unique contribution of target genes to these distinct phases of behavioral models of cocaine-induced plasticity. Specifically, this technique allows for selective ablation of target genes during discrete phases of a behavior to test their contribution to the behavior across time. Ultimately, this understanding allows for more targeted therapeutics that are best able to address the most potent risk factors that present themselves during each phase of addictive behavior. Cocaine is a highly reinforcing psychostimulant. Following repeated exposure, several molecular and cellular adaptations occur in reward-relevant brain circuitry that are believed to result in compulsive drug-seeking behavior, prompting high rates of relapse which pose a serious clinical problem 1. Cocaine exerts these long-lasting behavioral effects by regulating gene expression. To study the adaptations that arise from chronic cocaine use, preclinical rodent models have been used extensively. One such model is the conditioned place preference (CPP) paradigm. This model involves the development of a learned association between a previously neutral environment and the rewarding properties of cocaine. After several pairings of cocaine with a particular chamber, animals are allowed to freely explore the cocaine-paired and non-cocaine-paired environments and if they prefer the drug-paired compartment, they are said to have acquired a cocaine-induced place preference. Moreover, following an extinction training period, this paradigm can be used to study context-specific reinstatement of cocaine-seeking behavior. Compared to other behavioral models of addictive-like behavior, such as psychomotor sensitization, which is used to study long-term cocaine-induced behavioral and molecular plasticity 2,3 and self-administration (SA), that is thought to more accurately mimic addictive-like behavior found in humans, the CPP paradigm is a simple procedure to study cocaine contextual learning 4. CPP protocols can be conveniently extended to include extinction and reinstatement phases, similarly to SA, which allow for investigation of the mechanisms underlying drug craving and relapse 5-7 and which are believed to recapitulate aspects of what occurs in human drug-seeking behavior and drug- and cue-induced relapse 8-10. One mechanism that underlies the cocaine-induced behavioral plasticity that is characteristic of each of the distinct phases of CPP, including acquisition, extinction, and reinstatement, is activation of unique signatures of gene expression within different brain regions. To directly test which genes within reward-relevant brain regions mediate cocaine-induced behavioral changes, it is useful to be able to manipulate them selectively in a regionally-specific manner. One way of achieving this is to microinject recombinant adenoassociated viral (rAAV) vectors that express Cre recombinase using stereotaxic surgery, into distinct brain areas of mice that have target genes flanked by LoxP sites (floxed mice). This method allows for very precise temporal and regional control over when and where genes are ablated, in both dividing and non-dividing neurons, without inducing immune responses 11-13. This level of control represents an important advantage over traditional Cre-LoxP technology of breeding floxed mice with mice expressing Cre recombinase under the control of an endogenous gene promoter, in that the timing and distribution of gene deletion can be more tightly regulated. Additionally, viral vector-mediated gene knockout circumvents potential developmental compensatory effects that may occur using traditional knockout strategies. In addition to cocaine CPP, which is described here, microinjection of rAAV-Cre into the brain of floxed mice to assess the role of specific genes can be applied ubiquitously to behavioral paradigms that involve separate phases, including self-administration and psychomotor sensitization. For example, our laboratory has utilized the rAAV-Cre technology to study the role of Cav1.2 L-type Ca2+ channels in cocaine psychomotor sensitization 14. Specifically, rAAV-Cre was microinjected into the nucleus accumbens (NAc) of mice with the gene encoding Cav1.2 floxed, to demonstrate that Cav1.2 acting in this region mediates the expression phase of psychomotor sensitization 14,15. However, the rAAV-Cre strategy cannot be used if mice with a floxed gene of interest do not exist, as was our experience when assessing the role of Cav1.3 L-type Ca2+ channels in psychomotor sensitization. Hence, a limitation of using rAAV-Cre presents itself if conditional mice do not exist for a particular gene of interest. However, rAAVs that express siRNA can be used to knockdown target genes, as we have done to examine the role of Cav1.3 channels 14,15. Microinjecting rAAV-Cre into discrete brain regions of floxed mice and then testing them in the CPP paradigm allows for investigation into the specific genes that mediate the various phases of addictive-like behavior and where they are acting. Use of this paradigm has aided in our understanding of how repeated cocaine administration in essence hijacks the brains reward circuitry causing maladaptive changes in molecular signal transduction pathways and gene expression that lead to the addicted state 1,16,17. All procedures are conducted in accordance with the Weill Cornell Medical College Institutional Animal Care and Use Committee rules. If an instrument, sterile swab, or hand wearing sterile glove is contaminated by coming into contact with a non-sterile surface, discard or re-sterilize the instrument using a hot bead sterilizer, discard the swab or change to new sterile gloves. Place a mouse cage with bedding on a heat block to warm for post-operative recovery. Set up electric razor for shaving head and ethanol and iodine to sterilize the scalp. Wipe down ear bars and mouth hold of the stereotax with 70% ethanol. Using a 5 μl Hamilton syringe, draw up 5 μl of viral vector (1 x 106 viral particles/μl) and set up in syringe holder on stereotax. Microwave heating pad or turn electric pad on and place on stereotax. Cover with a clean absorbent pad to reduce the risk of burns. Monitor mouse body temperature (between 97-99.5 °F) frequently throughout procedure. Inject mouse (weighing between 22-35 g) with a mixture of ketamine (100 mg/kg) and xylazine (20 mg/kg). Once a mouse is anesthetized, pinch tail tip to check the mouse's reflexes and note any movement or response to ensure that the mouse is adequately anesthetized. Shave head between ears and eyes. Clean shaved head with alternating ethanol and iodine sterile cotton applicators. Transfer mouse to heated pad on stereotax. Wear sterile gloves throughout the surgery. If gloves are contaminated at any point by touching non-sterile surfaces, change gloves. Zero tooth bar and ear bar scales. Set teeth in tooth bar. Screw in muzzle. If wiggling or whisker movement is noted at any time, administer an i.p. booster dose (~0.05 cc) of a mixture of ketamine (100 mg/kg) and xylazine (20 mg/kg). Cut open scalp to just behind ears with a scalpel. Place bulldog clips on the corners of the scalp to peel the skin away from skull. Bregma and lambda should be easily visible. Make sure suture from bregma to lambda is aligned straight. If the suture is crooked readjust positioning of the head. Check to make sure all settings on the stereotax are zeroed. Put needle tip in place at bregma. Measure all coordinates for both bregma and lambda. This includes dorsal/ventral, medial/lateral and anterior/posterior coordinates. Adjust the head until the ventral coordinates for bregma and lambda are within 0.02 mm of each other. Once aligned, from bregma go medially out to the medial/lateral (M/L) coordinates. Make sure the left and right sides are aligned within 0.02 mm of each other. Re-center needle tip on bregma and from there move in the anterior/posterior (A/P) direction to the desired anterior/posterior coordinate. Measure the ventral position of the top of the skull to use as a reference after the borehole is drilled. Drill a borehole using a sterile drill bit at the desired coordinate. Check that the needle can enter uninterrupted through the skull. Lower the needle to the desired ventral coordinate. Once the coordinate is reached, dip 0.015 mm below for ~10 sec to create a small pocket for the viral vector. Inject the desired volume of viral vector at a rate of ~0.1 μl/min. Wait 3 min for viral vector to diffuse completely. Raise the needle tip 0.015 mm and wait an additional 2 min. Dip the needle (if doing angled injections) in the opposite direction. Again, record the ventral position as a reference for the top of the skull. Repeat the same steps as on the first side to inject viral vector on the opposite side (if doing bilateral injections). Apply bone wax to both holes to seal them using the wooden end of a sterile cotton applicator tip. Apply nerve block to the wounded area. Remove mouse from stereotax and place in warmed cage on heat block to recover for 45 min. Monitor for signs of pain including: decreased overall activity or restlessness, decreased food and water consumption or increased vocalization. Buprenorphine (0.05 - 0.2 mg/kg) can be administered twice daily for a week if necessary for pain. Acceptable alternatives include: meperidine (20-60 mg/kg), pentazocine (10 mg/kg), nalbuphine (4-8 mg/kg). Place mice into the central chamber of a three-chamber place preference apparatus (Med Associates Inc., St. Albans, VT, USA) for a 60 sec habituation period with guillotine doors closed. After habituation, open guillotine doors and allow mice free exploration of all 3 chambers for 1,200 sec, with time spent in each chamber being recorded using MedPC IV software (Med Associates, Inc.). Assign mice to conditioning chambers based on their performance during the pre-test. Using a biased design, pair drug administration during the subsequent 3 days with the compartment that was least-preferred during the baseline pre-test. During the next 3 conditioning days, inject mice with cocaine (10 mg/kg; i.p.) during the morning session and confine them in their assigned chamber for 1,200 sec immediately following the injection. Return mice to their home cages after the session. After 4 hr, inject mice with saline (0.01 ml/g body weight) and confine them to the opposite chamber for the 1,200 sec afternoon session. To test for acquisition, place mice in the central chamber with guillotine doors closed for a 60 sec habituation period. Open guillotine doors and allow free exploration for 1,200 sec, with time spent in all chambers recorded by MedPC IV software (Med Associates, Inc.). Calculate preference by subtracting the amount of time spent in the saline-paired chamber from the amount of time spent in the cocaine-paired chamber. To extinguish the place preference, expose mice to two 20 min sessions of free exploration daily in the same apparatus, separated by at least 2 hr, beginning 24 hr following the test for acquisition. Time spent in all chambers should again be recorded and the magnitude of the initial CPP should be compared with that of each extinction session. Determine whether mice have extinguished the drug-induced preference by assessing whether preference for a particular chamber across two consecutive extinction days is significantly lower compared to the acquisition preference score. Reinstate mice with a priming dose of cocaine (5 or 10 mg/kg; i.p.) and re-expose to the apparatus allowing free exploration and record the time spent in each compartment. Administer Euthasol euthanasia solution (150 mg/kg). Transcardially perfuse mice with 4% paraformaldehyde (PFA) and perform a histological examination to validate correct microinjection placement. After performing CPP on microinjected mice, one should verify that the cohort of control-injected (rAAV-GFP) mice have normally acquired preference for the drug-paired chamber (Figure 1A, 1B). Mice are considered to have acquired preference for a particular chamber when cocaine preference (time spent in the cocaine-paired chamber minus time spent in the saline-paired chamber) is significantly higher compared to baseline preference score (Figure 1B, A vs. B). If, as a cohort, control-injected mice do not show a preference for the cocaine-paired chamber, or show an aversion, placement should be verified immediately via histology (see rAAV Injections subsection) and mice with incorrect placement should be discarded. If preference has been normally acquired by the control-injected cohort, one can subsequently extend the paradigm by beginning extinction (Figure 1A ; Day 6 onwards). Mice are considered to have extinguished the drug-induced preference for a particular chamber when cocaine preference across two consecutive extinction days is significantly lower compared to the acquisition preference score (Figure 1B, E3, E4, E5 vs. A). At this time, one can reinstate with a drug prime (Figure 1A, 1B). If the preference score following administration of the drug prime is statistically indistinguishable from that at acquisition, then that cohort is said to have reinstated the drug-induced preference for the drug-paired chamber (Figure 1B, R vs. A). Prior to pursuing the rAAV-Cre experimental strategy within any behavioral paradigm one should verify that rAAV-Cre has in fact knocked out the gene of interest in microinjected mice by qPCR (Figure 1C) and/or western blot or immunohistochemical analysis 18. For example, following microinjection of rAAV-Cre-GFP into the NAc of mice that had the L-type calcium channel isoform Cav1.2 floxed, rAAV-Cre injected punches show a significant decrease in gene expression (Figure 1C). Additionally, we have shown by immunohistochemical analysis that rAAV-Cre can knockout Cav1.2 protein in the mouse brain 18. Following all behavioral analyses, mice should be transcardially perfused with 4% paraformaldehyde and fluorescent immunohistochemistry should be performed for green fluorescent protein (GFP). If bilateral structures were targeted, proper bilateral placement should be verified by fluorescent immunohistochemical staining (Figure 1D, representative targeting of the NAc). If the correct area has indeed been targeted, staining should be visualized exclusively in the intended region and not outside of it. If one or both of the injections are off-target, mice should be retroactively excluded from the CPP data set. Another strategy for visualization of accurate targeting of viral vector-infected brain regions and subsequent dissection of the infected area for biochemical analyses, can be achieved using a GFP-illuminating flashlight as described in Li and Wolf (2011) 19. Figure 1A. Experimental timeline of rAAV-Cre microinjection and conditioned place preference acquisition, extinction and reinstatement phases. rAAV-Cre is microinjected into the region of interest 2-3 weeks prior to the initiation of behavioral testing. Conditioned place preference begins with a pre-test to ascertain any initial biases, followed by 3 days of conditioning with cocaine (10 mg/kg, i.p.). Four hours after each cocaine conditioning session, mice are treated with saline and confined to the opposite chamber. The following day mice are tested for acquisition of a CPP. Extinction training begins 24 hr later and involves 2 daily sessions, that are separated by at least 2 hr, that allow free access to the entire apparatus. Once mice have reached the extinction criterion, they are administered a priming injection of cocaine (10 mg/kg, i.p.) and their time spent in all chambers of the apparatus is assessed to test for reinstatement of cocaine-seeking behavior. Figure 1B. Representative results of baseline, acquisition, extinction training, and reinstatement. WT C57BL/6J mice were treated with cocaine during days 2, 3 and 4 of conditioning. Mice exhibited acquisition, extinction and cocaine-induced reinstatement (10 mg/kg i.p. cocaine prime). ***p<0.001 versus baseline (B); #p<0.05 versus acquisition (A). Baseline, B; Acquisition, A; Extinction, E; Reinstatement, R. Figure 1C. Stereotaxic delivery of rAAV-Cre-GFP into the NAc of Cav1.2 floxed mice significantly decreased Cav1.2 mRNA. Homozygous Cav1.2 floxed mice were microinjected with control (rAAV-GFP) or experimental (rAAV-Cre-GFP) viral vectors. Following maximal Cre activation, mice were sacrificed and mRNA was isolated and relative expression levels were examined via quantitative polymerase chain reaction using Cav1.2 specific primers. 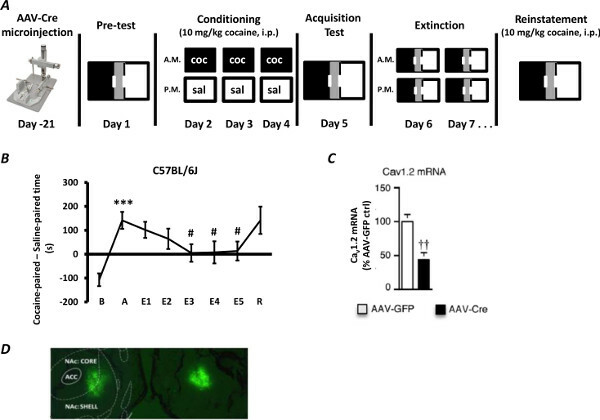 Stereotaxic delivery of rAAV-Cre-GFP into the NAc of Cav1.2 floxed mice significantly decreased Cav1.2 mRNA levels, compared to mice injected with AAV-GFP. ††p<0.001 versus rAAV-GFP. Figure 1D. Neurons microinjected with rAAV-GFP in the mouse NAc. Homozygous Cav1.2 floxed mice were microinjected with rAAV-GFP to check for proper bilateral placement in the NAc. Mice were perfused with 4% PFA and immunohistochemistry was performed. GFP staining demonstrates proper bilateral targeting of the NAc. Click here to view larger figure. Regionally- and temporally-specific gene ablation via stereotaxic microinjection of viral vectors combined with CPP that includes extinction and reinstatement phases allows for investigation of the specific contributions of genes to three distinct phases of addictive-like behavior. While conditional knockout that is achieved utilizing the traditional Cre-LoxP system provides for spatio-temporally restricted gene ablation, stereotaxically microinjecting Cre-recombinase into discrete brain areas of floxed mice allows for even tighter control of when and where a gene is knocked out. Additionally, this circumvents the possibility of compensatory changes occurring during development, which sometimes accounts for limited phenotypic variation observed in knockout mice. Moreover, using cohorts of mice that were microinjected at various time points during the behavior can allow for causal links to be made between a change in gene expression and a change in behavior. Importantly, this technique can be applied to several different cocaine behavioral paradigms including self-administration and psychomotor sensitization. It is important to wait at least 10-14 days following surgeries to ensure that maximal activation of Cre recombinase has occurred 20. Beginning behavioral testing prior to this can result in the use of mice with an unknown amount of sub-maximal Cre expression, making behavioral findings difficult to interpret. Maximal activation of Cre results in complete knockout of a gene; however, this only occurs in cells that are in fact infected. Depending on the volume and the titer of the viral vector, approximately 50-70% of cells are infected for a given region resulting in the corresponding amount of mRNA and protein knockout which can lead to some residual gene expression (Figure 1C). However, we have demonstrated that a 50-60% mRNA this type of knockout is sufficient to alter expression of psychomotor sensitization14. Moreover, this method is ideal for longer behavioral paradigms as once Cre activation occurs in vivo, its expression and the corresponding gene knockout lasts for at least 6 months21. If one is interested in examining the role of a gene over a more discrete period of time however, that is not possible with this particular method. For shorter-term expression, herpes simplex viral (HSV) vectors can be used, which preferentially infect neurons22. Compared to rAAV expression of Cre recombinase, which persists for longer periods as the promoter is not silenced after days or weeks in vivo 23, HSV vectors are preferred for transient expression as they express in vivo for days. HSV vectors are also advantageous in that they demonstrate broad transduction efficiency and that helper virus-free stocks exist 22. Moreover, HSV vectors can also express Cre recombinase and mediate the excision of floxed sequences both in culture and in vivo 24. However, occasional cytotoxicity has been found. Almost any region within the brain can be targeted using this microinjection technique. When attempting to target smaller subregions within a larger region, one may need to optimize the amount of viral vector used. For example, we microinjected 0.5 μl of rAAV-Cre-GFP to target the NAc and ventral tegmental area (VTA) 14, whereas when targeting larger structures such as the hippocampus and cortex, Ahmed and colleagues 20 used 0.8 μl of rAAV-Cre. Alternatively, exploring various serotype options that each have differential spread and infectivity properties (see Choi et al. (2005) 25 for review) can aid in targeting a smaller, more defined area. Conversely, if attempting to target a larger region, one can increase the volume of viral vector microinjected. This is more efficacious than utilizing higher vector titers as they likely yield additional infections per cell as opposed to a higher number of total cells infected 22. Additionally, one can perform multiple injections within a region, or across multiple regions, to more effectively infect a larger area 26. Use of rAAV vectors is also advantageous when compared with other viral vectors that are used to examine brain function and disease. Specifically, traditional adenoviral vectors proved problematic in that they induced severe inflammatory responses, while other vectors such as retroviruses and lentiviruses can involve issues with insertional mutagenesis. rAAV is a benign parvovirus and there is no known disease associated with rAAV infection. Moreover, unlike other viral vectors, transduction with rAAV occurs without the expression of native AAV viral proteins 27, making secondary effects on target cells much less of a concern. rAAV vectors can be produced in high titers and can transduce post-mitotic neurons in the brain in a highly spatially localized manner 21,28. Moreover, rAAV vectors are now being generated that can target specific subtypes of neurons in the mouse brain 29 and Cre-dependent rAAV expression systems are also becoming more widely used (see Zhang et al. (2010) 30 for review). In summary, cocaine CPP serves as a simple yet informative behavioral tool to study cocaine contextual learning relevant to the acquisition, extinction, and reinstatement of cocaine-seeking behavior. A combination of utilizing rAAV expressing Cre recombinase in mice carrying a floxed allele with CPP provides a powerful strategy for exploring the role of target genes in specific brain regions that mediate cocaine seeking behavior. The authors would like to thank Anni Lee and Maureen Byrne for their help in establishing the extended conditioned place preference protocol. Nestler, E. J. Molecular neurobiology of addiction. American Journal on Addictions. 10, (3), (2001). Thomas, M. J., Kalivas, P. W., Shaham, Y. Neuroplasticity in the mesolimbic dopamine system and cocaine addiction. British Journal of Pharmacology. 154, (2), (2008). Robinson, T. E., Browman, K. E., Crombag, H. S., Badiani, A. Modulation of the induction or expression of psychostimulant sensitization by the circumstances surrounding drug administration. Neuroscience and Biobehavioral Reviews. 22, (2), (1998). Tzschentke, T. M. Measuring reward with the conditioned place preference (CPP) paradigm: update of the last decade. Addiction Biology. 12, (3-4), (2007). Mueller, D., Stewart, J. Cocaine-induced conditioned place preference: reinstatement by priming injections of cocaine after extinction. Behavioural Brain Research. 115, (1), (2000). Itzhak, Y., Martin, J. L. Cocaine-induced conditioned place preference in mice: Induction, extinction and reinstatement by related psychostimulants. Neuropsychopharmacology. 26, (1), (2002). Kreibich, A. S., Blendy, J. A. cAMP response element-binding protein is required for stress but not cocaine-induced reinstatement. Journal of Neuroscience. 24, (30), (2004). Obrien, C. P., Childress, A. R., McLellan, T., Ehrman, R. Integrating systematic cue exposure with standard treatment in recovering drug dependent patients. Addictive Behaviors. 15, (4), (1990). O'Brien, C. P., Childress, A. R., McLellan, A. T., Ehrman, R. A learning model of addiction. Research publications - Association for Research in Nervous and Mental Disease. 70, (1992). Stewart, J. Psychological and neural mechanisms of relapse. Philosophical Transactions of the Royal Society B-Biological Sciences. 363, (1507), (2008). Bueler, H. Adeno associated viral vectors for gene transfer and gene therapy. Biological Chemistry. 380, (1999). Xiao, X., Li, J., McCown, T. J., Samulski, R. J. Gene transfer by adeno-associated virus vectors into the central nervous system. Experimental Neurology. 144, (1), (1997). Alexander, I. E., Russell, D. W., Spence, A. M., Miller, A. D. Effects of gamma irradiation on the transduction of dividing and nondividing cells in brain and muscle of rats by adeno-associated virus vectors. Human Gene Therapy. 7, (7), (1996). Schierberl, K., Hao, J., Tropea, T. F., Ra, S., Giordano, T. P., Xu, Q., Garraway, S. M., Hofmann, F., Moosmang, S., Striessnig, J., Inturrisi, C. E., Rajadhyaksha, A. M. Ca(v)1.2 L-Type Ca2+ Channels Mediate Cocaine-Induced GluA1 Trafficking in the Nucleus Accumbens, a Long-Term Adaptation Dependent on Ventral Tegmental Area Ca(v)1.3 Channels. Journal of Neuroscience. 31, (38), (2011). Schierberl, K., Giordano, T., Satpute, S., Hao, J., Kaur, G., Hofmann, F., Moosmang, S., Striessnig, J., Rajadhyaksha, A. Ca(v)1.3 L-type Ca2+ channels mediate long-term adaptation in dopamine D2L-mediated GluA1 trafficking in the dorsal striatum following cocaine exposure. Channels. 6, (1), 11-17 (2012). Nestler, E. J., Bergson, C. M., Gultart, X., Hope, B. T. Regulation of neural gene expression in opiate and cocaine addiction. NIDA Research Monograph. 125, (1993). Hyman, S. E., Malenka, R. C. Addiction and the brain: The neurobiology of compulsion and its persistence. Nature Reviews Neuroscience. 2, (10), (2001). Lee, A. S., Ra, S., Rajadhyaksha, A. M., Britt, J. K., De Jesus-Cortes, H., Gonzales, K. L., Lee, A., Moosmang, S., Hofmann, F., Pieper, A. A., Rajadhyaksha, A. M. Forebrain elimination of cacna1c mediates anxiety-like behavior in mice. Molecular Psychiatry. 17, (11), (2012). Li, X., Wolf, M. E. Visualization of virus-infected brain regions using a GFP-illuminating flashlight enables accurate and rapid dissection for biochemical analysis. Journal of Neuroscience Methods. 201, (1), 177-179 (2011). Ahmed, B. Y., Chakravarthy, S., Eggers, R., Hermens, W., Zhang, J. Y., Niclou, S. P., Levelt, C., Sablitzky, F., Anderson, P. N., Lieberman, A. R., Verhaagen, J. Efficient delivery of Cre-recombinase to neurons in vivo and stable transduction of neurons using adeno-associated and lentiviral vectors - art. no. 5. BMC Neuroscience. 5, (2004). Kaspar, B. K., Vissel, B., Bengoechea, T., Crone, S., Randolph-Moore, L., Muller, R., Brandon, E. P., Schaffer, D., Verma, I. M., Lee, K. F., Heinemann, S. F., Gage, F. H. Adeno-associated virus effectively mediates conditional gene modification in the brain. Proceedings of the National Academy of Sciences of the United States of America. 99, (4), 2320-2325 (2002). Neve, R. L., Neve, K. A., Nestler, E. J., Carlezon, W. A. Use of herpes virus amplicon vectors to study brain disorders. Biotechniques. 39, (3), 9 (2005). Pohl, M., Braz, J. Gene therapy of pain: emerging strategies and future directions. European Journal of Pharmacology. 429, (1-3), (2001). Rinaldi, A., Marshall, K. R., Preston, C. M. A non-cytotoxic herpes simplex virus vector which expresses Cre recombinase directs efficient site specific recombination. Virus Research. 65, (1), (1999). Choi, V. W., McCarty, D. M., Samulski, R. J. AAV hybrid serotypes: Improved vectors for gene delivery. Current Gene Therapy. 5, (3), (2005). Passini, M. A., Dodge, J. C., Bu, J., Yang, W., Zhao, Q., Sondhi, D., Hackett, N. R., Kaminsky, S. M., Mao, Q. W., Shihabuddin, L. S., Cheng, S. H., Sleat, D. E., Stewart, G. R., Davidson, B. L., Lobel, P., Crystal, R. G. Intracranial delivery of CLN2 reduces brain pathology in a mouse model of classical late infantile neuronal ceroid lipofuscinosis. Journal of Neuroscience. 26, (5), (2006). Samulski, R. J., Chang, L. S., Shenk, T. Helper-free stocks of recombinant adeno-associated viruses - normal integration does not require viral gene-expression. Journal of Virology. 63, (9), (1989). Kaplitt, M. G., Leone, P., Samulski, R. J., Xiao, X., Pfaff, D. W., Omalley, K. L., During, M. J. Long-term gene-expression and phenotypic correction using adenoassociated virus vectors in the mammalian brain. Nature Genetics. 8, (2), (1994). Johansen, J. P., Hamanaka, H., Monfils, M. H., Behnia, R., Deisseroth, K., Blair, H. T., LeDoux, J. E. Optical activation of lateral amygdala pyramidal cells instructs associative fear learning. Proceedings of the National Academy of Sciences of the United States of America. 107, (28), (2010). Zhang, F., Gradinaru, V., Adamantidis, A. R., Durand, R., Airan, R. D., de Lecea, L., Deisseroth, K. Optogenetic interrogation of neural circuits: technology for probing mammalian brain structures. Nature Protocols. 5, (3), (2010).